Some constructive criticism? Star Wars writers often try to avoid using "earth terms" like "May Day" because you know, there is no "May" in Star Wars. Also: Are those fighters inspired by the A-9 Vigilance Interceptors? As for the fighters, you may want to ask about his designs. I gave him complete freedom and artistic liberties with ship/alien designs, etc. Yes, the fighters we see on this page where inspired by A-9 Vigilance Interceptors, and like the abandoned ship from the first page they are not entirely of mine design. But the ship on the page 3 (Sophonisba) is entirely my creation. 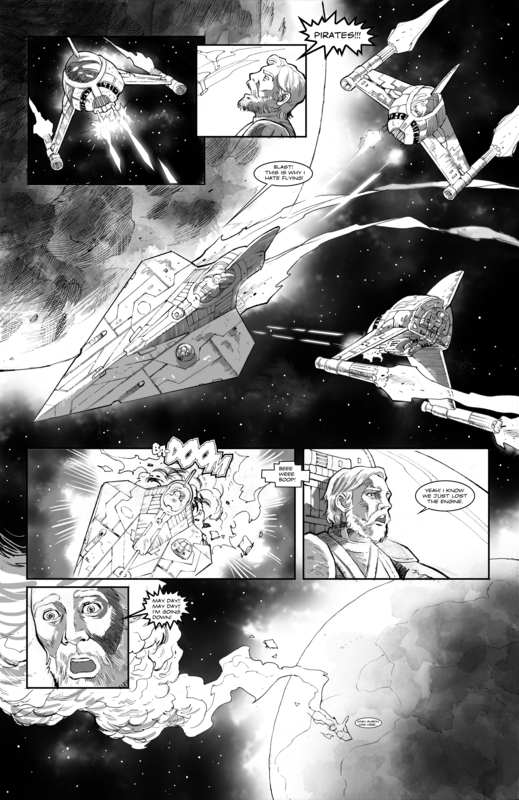 For the look of most of the ships that appear in these pages i tried to stick close to designs that had already appeared in Star Wars universe. Incredible work here my friend! Probably one of the best fan made star wars comic I've seen so far. Thank you guys, and i am sure this story will get even better with new pages. No you don't Obi. You'd never hear the end of it. Echo watched silently as Ahsoka stirred in her sleep. Little did he know that someone was watching every move he was making, waiting for him to slip.